Following a trial in the High Court in May 2004, composer and editor Lionel Sawkins, represented by Carter-Ruck, has won an action for copyright infringement against Hyperion Records Limited, the record producers. The case made new law, laying down what is required in order to establish copyright in a musical work, on which there was previously no direct legal authority. Lionel Sawkins is acknowledged to be a world authority on the music of Michel-Richard de Lalande. 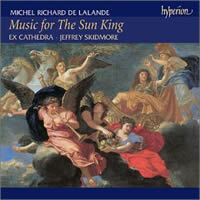 Lalande, who died in 1726, was the principal court composer to the French monarchs Louis XIV and Louis XV. Dr. Sawkins was a lecturer in music at the Roehampton Institute prior to his retirement in 1985. He has devoted much of his retirement to writing and lecturing on Lalande’s music and also to preparing editions of his compositions. What survives of Lalande’s work comprises a mixture of manuscript and copy sources, which are very often incomplete and inconsistent with each other. It is not possible for the music to be performed directly from the sources and the intervention of a knowledgeable and experienced editor like Dr. Sawkins is necessary for scores to be produced from which performers can play. While some of his work comprises recomposition of individual notes and passages missing from the music, much of the process of editing involves resolving ambiguities in the source material and adding items such as figuring, ornamentation and performance directions. Dr. Sawkins’ editions of Lalande (and other Baroque composers such as Lully, Rameau and Royer) have been performed and recorded all over the world. In 2001 he prepared editions of four Lalande works which were performed by Ex Cathedra, a choral ensemble specializing in early music, at concerts in Paris and Birmingham and recorded by them for the purposes of a CD to be issued by Hyperion Records Limited. Shortly before the recording took place, Hyperion made it clear that they would not recognize Dr. Sawkins’ copyright in the editions, arguing that the only copyright in the works belonged to Lalande, and that Dr. Sawkins had no right to royalties arising out of the recording or to any say over how it was to be further exploited. Despite Dr. Sawkins’ protestations, the CD (entitled “Music for The Sun King”) went on sale in 2002. After lengthy attempts to negotiate a settlement himself, in 2003 Dr. Sawkins approached Carter-Ruck. The firm has an arrangement with NATFHE, the university and college lecturer’s union, of which he is a member, to consider whether it will conduct cases of potential defamation and other media-related cases involving its members on a conditional fee basis. Carter-Ruck agreed to take Dr. Sawkins’ case on as a conditional fee case and subsequently secured insurance for him against his liability to pay the defendant’s costs had his case been unsuccessful. The trial took place in May 2004 and lasted six days. Judgment was handed down by Mr. Justice Patten in July 2004. He decided that the work undertaken by Dr. Sawkins in producing his editions was sufficient for him to be entitled to copyright protection (although he decided that in relation to one of the four works an insufficient amount featured on the CD for his copyright to have been infringed). Hyperion had also sought to argue that Dr. Sawkins had granted it a license to reproduce the works and that he had copied part of one of them from a previous edition. The judge also rejected these arguments. In the case of Dr. Sawkins’ editions, he decided that it was. An enquiry will follow as to the amount of the damages to which Dr. Sawkins is entitled. Hyperion will be obliged to notify Dr. Sawkins and seek his permission before any further exploitation of his work can take place. He was also awarded all his legal costs of the proceedings. Ruth Collard represented Dr. Sawkins, assisted by Antonia Foster. In May 2004, Hyperion lost a copyright dispute with Dr. Lionel Sawkins, who sued the company for breach of musical copyright that he claimed to own in his editions of the French Baroque composer Michel-Richard de Lalande (1657-1726). Hyperion had used those editions (having paid the appropriate hire fee) in a recording with Ex Cathedra titled “Music for The Sun King,” issued in 2002. Hyperion is appealing against the decision. In order to succeed in a claim to musical copyright, Dr. Sawkins has to demonstrate that his editions are original musical works. Fundamentally, Hyperion’s firm view is that an edition of an existing musical work that is a faithful reproduction of Lalande’s music cannot itself be an original musical work. Hyperion has never denied the labor involved in producing an edition. This might enable Dr. Sawkins to claim a copyright in the text of his editions as a literary or typographical copyright. With such a copyright, Dr. Sawkins could prevent someone else from copying his editions without a license and he could therefore control the use of his editions and demand an appropriate hire fee for their use. As such, Dr. Sawkins would receive reward for his work. What Hyperion contests is the idea that an edition of an existing musical work which does not involve an impact on the sound — an impact that would impart a real value to a new edition over and above that belonging to the original musical work — should be seen as an original musical work. Hyperion Records made the decision to appeal because it felt that there were several important issues that were not addressed or properly understood in the original case. A key musical issue that the decision of the court did not seem fully to understand involves the distinction between “the realization of a figured bass” and “the figuring of a bass line.” Most specifically, in relation to one of the musical works, Venite Exultemus, Mr. Justice Patten found that “most of the work relates to the figured bass … I do not accept that changes or additions to the figured bass are not capable of adding qualitatively to the musical work and I consider that [he] did therefore acquire copyright in his version of the Venite” (Judgment ¶67). The figuring of a bass line is a shorthand notation conveying the harmonies (already defined by the other written instrumental parts of the score) that a keyboard player should play. The realization of the figured bass involves writing out these harmonies in full, specifying precise keyboard registration, figuration and any ornamentation (although these are in practice only ever treated by performers as editorial suggestions). The Music Publishers’ Association has provided guidelines on copyright and identifies the industry’s understanding on what level of musical work attracts copyright. These guidelines state that “the realization of figured bass or provision of keyboard accompaniment for performance” entitles the editor to a 100% mechanical royalty. Realization of a figured bass is a practice routinely undertaken at sight by Baroque performers, yet what Dr. Sawkins has done does not amount to this. Dr. Sawkins added additional figures to the bass line over and above those already written in the source material. He did not realize the figured bass. The realization of this figured bass still had to be undertaken by the performers. A significant proportion of Dr. Sawkins’ editorial amendments were performance indications such as phrasing and tempo marks, which the MPA guidelines recognize as warranting an editor’s fee only and not copyright; there were also a number of corrections of obvious textual errors necessary to restore a plausible version of the music as it appears in the manuscript source(s). While obviously valuable work, this is not in any way original or creative. In a wider sense, the inflexible procedures of the MCPS (Mechanical-Copyright Protection Society) have exacerbated this situation. An issue as complex as this should not be resolved in a court of law; there should be a fairer system, overseen by an independent and musically qualified body, of assessing copyright claims. John Rutter refers to a now-abandoned Performing Right Society scheme whereby the editions were scrutinized by a classification committee and the extent of their creativity assessed on a sliding scale from 1 to 12, and concludes that “This was a fair and sensible way of recognizing that copyright is a concept intended to reward creativity, not scholarship or diligence.” This would also get around the anomaly of an editor claiming 100% copyright on an edition of music where the original copyright has expired, a claim that suggests that the edition embodies music that is solely theirs. If the first instance decision is allowed to stand, the consequences for the recording industry will be far-reaching. Publishers will be able to exert copyright on a whole swath of editions which are currently in the public domain, where they have involved the labor of an editor but no original creative music. This is contrary to the perception of copyright law currently held by music publishers, record companies and most editors themselves. The appeal will be heard on 15-18 March 2005 at the Appellate Courts in the Royal Courts of Justice. Should Hyperion lose, the financial liability will be in the region of one million pounds [1.87 million dollars]. This is a potentially crippling sum for a company of Hyperion’s size (employing 12 people) and is likely to threaten the company’s position as a flagship British enterprise on the international music scene. At best, the consequences will be a drastic reduction of the company’s investment both in important recording projects, including the promotion of unjustly neglected repertoire, and in prestigious artists, including the nurturing of young British talent.